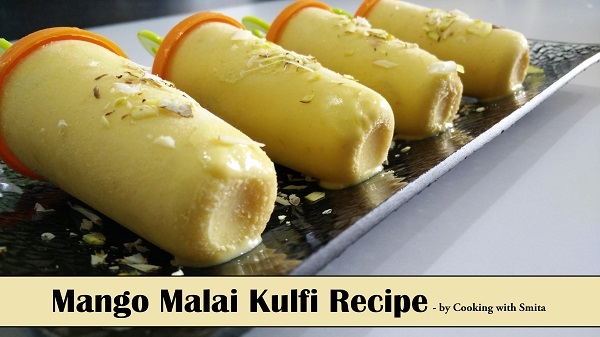 Mango Malai Kulfi – a sinfully rich and creamy Indian frozen dessert is very easy to make at home. Kulfi is favourite dessert in India whether it is a family get-together or party. During this Mango season, let’s add flavour to it and make Mango Kulfi by adding fresh Mango Puree. Learn how to make kulfi at home with this step-by-step recipe guide. Heat milk in a pan over medium flame till it starts boiling. When it starts boiling, lower the flame and add Condensed Milk and stir. Now add Milk Powder and stir. Make are there are no lumps. Boil the milk over a high flame for 10 minutes, stir continuously. Remove the milk sticking to the sides of the pan while boiling milk and add it into milk; it will thicken the milk. After 10 minutes, switch off the gas and let it cool down for 10 – 15 minutes. Now add Mawa and stir so that it incorporates well with milk. Make sure that Milk is still warm while adding Mawa. Add Dry Fruits and mix well. Now let it cool down to room temperature. After cooling the Kulfi mixture, add Mango puree, mix well. Add Mango puree only after cooling Kulfi mixture. Shift the Kulfi mixture in Kulfi Moulds and freeze for 6 – 8 hours until set. To easily remove Kulfi from the mould, place Kulfi Mould in tap water for 30 – 40 seconds and then unmould.